Who says samosas can’t be gluten-free? 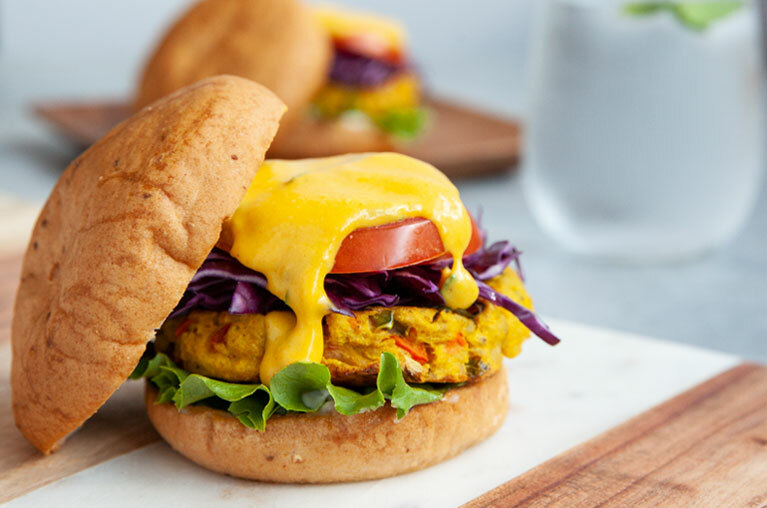 All the delicious ingredients of a traditional samosa have hopped out of their pocket and come together as an amazing gluten-free burger. Flavours of turmeric, soft potato, peas, carrots, and cilantro hit your curry craving hard, while a plant-based turmeric yogurt keeps a great balance between spicy and cool. Toss it on our delicious Millet & Chia buns and enjoy! Make the patties. In a large pan, sauté the onion and pepper in oil until softened, approximately 5 minutes. Add garlic, ginger and spices and continue cooking 2 minutes. Set aside. In a large bowl, roughly mash the cooled potatoes. Add carrots and onion mixture and continue mashing, leaving a bit of texture. Add the peas, bread crumbs, cilantro, salt and pepper and gently toss to combine. Divide the mixture into 6 equal balls and form into patties. Place them on a parchment covered cookie sheet and bake until the bottom side is golden brown, approximately 20 minutes. Gently flip and continue cooking until the second side is golden brown, an additional 15 minutes. Make the turmeric yogurt sauce. Combine all the ingredients in a small bowl and set aside. To serve, oil the buns and place them in the oven until warmed through, approximately 5 minutes. Place patties on buns, top with vegetables and yogurt sauce. Serve immediately.